From the coldest and highest Distillery in Scotland. Dalwhinnie, Scotland, has a population of 80. That’s not a typo. It is home to a small schoolhouse, a pub, an inn, a train station, and the Dalwhinnie Distillery. What else do you need, really? The distillery, founded in 1897 by John Grant, is famous for being the coldest and the “highest” distillery in Scotland. When you are talking about spirits, “highest” can mean several things right? In this case, we are talking about altitude, sitting at nearly 1100 feet above sea level. Only 10% of production ends up in their single malt nameplate, and they are a small shop to boot with only one wash and one spirit still each. The rest goes into the famous blended Scotch “Black & White.” So grab what you can get your hands on. Dalwhinnie has a reputation for creating light, almost gentle Whiskies, and Dalwhinnie 15 Year is their most famous expression. Matured only in Bourbon refill casks this malt got awarded 95 points in Jim Murray’s Whisky Bible. Its flawless, clean and crisp flavors give this Highlander a recognizable place in the Diageo's Classic Malts range. What does Dalwhinnie 15 Year Old taste like? The Flavour Spiral™ shows the most common flavours that you'll taste in Dalwhinnie 15 Year Old and gives you a chance to have a taste of it before actually tasting it. A big, crisp, dry and very aromatic nose... apples, vanilla, and citrus. Smooth, soft and lasting flavors of heather-honey sweetness, apple peels and vanilla followed by deeper citrus-fruit flavors and hints of malted bread. Long, lingering, surprisingly intense finish that starts sweetly, then gives way to vanilla, apples, walnuts, smoke and malt. Honey, walnut, vanilla, apple and apple peels, caramel, sweet, floral, citrus, fire. Very smooth drink with only a hint of Peat. After the third drink the Scotch comes alive with slit bite but goes down within almost no after taste. Me and my friend liked this one. Alot of flavor from fruit and vanilla but has a strong warm kick at the end. Not a favorite, but fun to taste! Smooth, with a little smoke. Smooth, subtle and pleasant. On the verge of too subtle. I tried it neat, and also with an ice cube, and where most others improve with ice/water, this one was better neat. Not my favourite but happy I tried it. One of the smoothest Scotches I have ever had. Has cream-ie texture all the way through . Would buy a case if I had the money. Clean, peaty, sharp bite followed by smooth finish. Fácil y suave de beber, con un gusto dulce y agradable. Dry and slightly harsh, but not a bad whisky. Would probably not be my first choice but wouldn't say no to it. Very gentle peat.... pretty good for having peat in it. Very good scotch. One of the ones o go to when I want a light kick. Syrup and cake for me. Very light notes but still worth a sit down with it. I’m not an avid whiskey drinker but this was impressively smooth. Honey, vanilla, and caramel together make for an exceptionally round mouthfeel. Really enjoyed this. Very smooth with a very nice flavor. This is an all time go to scotch. Smooth with great body and flavor. Very tasty, light smoke with smooth honey and caramel notes. Light floral aroma, super nice smell. Didn’t taste the apple peels or citrus per the tasting notes. Like the caramel and nice finish. The more I tasted it the more I liked it. Light and easy to drink, but not too interesting. I love how sweet this Scotch taste!! Among my favorite scotches. Well-balanced, neither too sweet nor too smokey. A benchmark scotch. Surprised by how much I like it. Solid taste, good smoke, and not rough at all. A little smoky and sweet. Hate the flimsy box but I'm not trying to enjoy the packaging. Great for after dinner. Extremely light & smooth with a hint of citrus . Loved this Highland offering.. I got a very light nose of roast beef and oak. Lightly oiled texture. Hard to believe it's 15 years with such a light yellow color. It begins with a citrus and turning into a honey before lasting into a white pepper. You must take some time between tasting or else it becomes sour-like. It's a good one for the Highland corner of your collection. Very smooth but light and delicate. Citrus, honey, vanilla notes give it that sweet flavor. I however favor a more bold taste. Although not a bottle i would purchase it is very good choice if you like a more delicate drink. My second favorite single malt. Not much on the nose but great flavor and easy to enjoy paired with a great steak or cigar. I hate to say it but this one was a bit disappointing. I ordered a tasting box to get this one specifically and I found it to be rather boring. I tend to favor bourbon over scotch but Dalwhinnie really seemed to call to me but unfortunately i don’t think I’ll be buying a bottle. As far as nose I actually picked up smoke maybe a sort of tobacco? Not as heavy as say a Talisker but it was there for me. Tasting was really what sealed the deal for me, I just wasn’t excited. I did pick up fruity/zesty notes but it all seemed boring. Sorry Dalwhinnie.I’m not sorry i tried you but im sorry I won’t be returning any time soon. Surprisingly delicious on the palate after an almost non-existent nose. My palate is quite inexperienced but this stuff was a homerun! Paired with a Cuban cigar they played so well together, each accentuating the lovely floral notes that just kept getting more and more pronounced as each went on. Only downside is that I only had the one dram. Will be adding this to the home bar for sure! Very sweet and fruity with a hint of smoke. Very good but not my favorite. Not going to put in my liquor cabinet but decent drink. Dalwhinnie has long been my favorite single malt. The 15 tear old was exceptionally smooth and even sweeter than my typical Dalwhinnie; the caramel and fruit flavors really shine. Absolutely wonderful! Sweety caramel notes, a gentle smoke with a hit of vanilla left in the mouth. Would order again in a bar, unlikely to buy a whole bottle. Smooth, smoky and sweet, slightly floral. Kk likes it! Wonderful smells and tastes of apples, sweet with a light peppery, smokey, finish. My wife, who does not like scotch AT ALL, liked this one, so it's definitely a winner in our home, with many future reappearances. Full of flavor with nice after taste. Smooth and soft spoken, Apple aroma with just a touch of smoke. EASY! This is a very smooth single malt and finishes nicely. Never understood the word “butterscotch” until I had this. THEN I got it. Buttery and smooth. Don’t drink it cold. I can taste a wild spark of vanilla with citrus added with a touch of creamy flavor. I could enjoy this with a few cubes of ice. Really smooth, one of the smoothest single malts I've tasted. Also sweet and not at all smoky. I really enjoyed sipping on this one. I liked this one. It was quite smooth with a slight sweetness at the finish. Nice nose as well. Very clean and smooth whiskey, strong honey nose with hints of smoke throughout. Well balanced and relaxing. Very smooth. My go to drink after a long night at work takes the edge off perfectly. Very unsuspecting bottle, but wow! Slightly smoky, sweet, and super smooth! Refreshing smell with honey, vanilla and fruit very noticeable. Unfortunately there wasn't much to distinguish the dram once you took a taste. Relatively smooth but....not much else to say. Smoke flavors mildly finish it off. Meh. This is really tasty! This highland scotch is amazing! I love the honey notes! Absolutely delicious. One of my go to everyday soothes. Been a fan for years! The fire definitely hits your lips, initially. Thought it had a buttery feel on the tongue. Pretty dang smooth. Good. Just not as complex. Solid dram, but it’s rather disappointing for 15 years old. Alcohol sharpness present. If you like the Highland profile of flavors, buy Old Pulteney 12. It’s twice as good and half the price!!! I definitely smell an apple aroma.. I smell a lot of fruit, actually. Interesting. First sip, the smoke comes out immediately as it hits my tongue. The apple and vanilla notes come in side by side with the light smoke. It ends with a delicate floral note and a hint of citrus and heat. If I wanted to be poetic about this... I'd say it makes me nostalgic of childhood visits to a cider mill in the autumn. The apple, the smoke and slight floral presence... it's a good experience but will not be a bottle purchase for me. I am beginning to think I might not like smoke in my whisky. Lightly sweet, classic central Highland single malt from the top of Loch Ericht. Light and fruity with heather on the nose. Dalwhinnie was a very smooth scotch, with a hint of spice. A nice smooth beginning, and a touch of fire at the end. One of my favorites to date. little sweetness with a smokey aftertaste. the aftertaste stays long after drinking, not sure if i liked that. Dalwhinnie is like sipping a lovely dram while seated in the heather among the mountains. The honey and heather notes keep the bite low in this whisky. It is a smooth yet spicy drink with a friendly burn at the end of the draw. It definitely will accept ice or water to open itself further to the palate. Nose is quite similar to Auchentoshan 12 which is very nice; it’s bolder and a very little smoky. Great taste, nice, long, intense finish. I must say I like it a lot. Great with diet coke!! Kiddin people, take it down a notch. I definitely got the honey hints and the caramel for sure. No medicine burn, will order a bottle for my bar this week! Light, fairly smooth. Nice burn at the end. This scotch has many flavors but the fire at the end overpowers them. This is a classic example of a decent scotch that could be a good or a great, but is just a little too harsh to get it there. I really enjoyed this scotch. It had a robust, smooth flavor with subtle hints of vanilla, walnut, and honey. Would recommend this as a gateway to scotches for bourbon drinkers. Smooth smoky, honey and fruit smells. Very delicious, vanilla flavor, mild orange. Sweet aftertaste, mildly sour cherry. Very nice, I would recommend it to everyone. A vety nice whisky, which in my opinion grows flavor with a small sip of water. Even I, a true novice when it comes to tasting spirits, can really feel the sweet notes of honey, vanilla and caramel in this one. Great, sweet taste and smell. Lighter, more subtle, more drinkable whisky. It has a good taste. I would say it is very nice in the variety of flavours. I like it. One of my all time favorite scotches! I enjoyed the crisp aroma, but noticed more barley than honey or sweetness in the flavor. Pleasant enough, but nothing I would seek out. Smoky, sweet, strong, smooth. This whisky tries to combine all and does not impress me at all. It’s all one big blend of average tastes which is a shame really. Smooth, light peaty taste, and good finish. When I want whisky with hints of flower and leather. This is where I go. Very smooth. This one is really smooth and has good flavor. If you'er looking for something to really zap you with heavy boldness then try something else. I found it Very enjoyable! Comfortable, not hard to enjoy. Nothing special about it.. The peat is missing. This one is for smooth whisky lovers. Very good, and for the price at Total Wine and More is great deal! Smooth, but rather short in taste. A great choice for highland Scotch. Less crisp and sweet than a lot of other Highlands and more savory and rich. A very complex flavor. Sweet and nice aroma. Strong initial kick but very sweet sugary almost unusualy honeylike following (at least for such spirit). Not smokey at all and I like that. Pleasent after taste. Good but not perfect. Nice companion for casual evening. Not a big fan of scotch, some are ok, some not. I really like this one, and will order again. very subtle peat and smoke, but enough to tell you that this is a scotch. as a newbie to scotch I love this drink. Good aroma, light and sweet. Thought it had a rough, smokey finish. Nice aroma, very light with a nice long aftertaste. I enjoyed it and will drink it again. I really liked this. It was my favorite of the 3 in my welcome box. It is complex and smooth. Not too smokey or peaty. Still on the sweeter side. Not great but not bad. There was the slightest whiff of honeysuckle or similar aromatic floral scent on the nose. On the palate I found a very small taste of peat and a continuation of a honeyed undertone. I did not taste a lot on the finish other than the whisky burn. I have owned a bottle of Dalwhinnie 15 in the past, but I don't know that I would buy it again, especially with all of the better options available today. Agressif dès l'entrée en bouche. Not for me. Did not care for the burning as it went down my throat. I was under the impression that the older scotch gets the smoother it gets. Not a nice smell or flavor for me. A very rounded 15 year old scotch with a nice long finish. I liked it very much. Smooth taste with the hint of Smokey. i had the sample and bought a bottle enough said. Smooth. There's a touch of sass but it's otherwise quite palatable with finishing on a sweet note. Thanks to my first Tasting Box, I have discovered I'm not a fan of scotch. I liken this one to drinking a charcoal fire even though there were aromas of green apples. Too much smoke and peat. A nice sweet scotch. Slight smoky peat nose. Light on the palate. Smooth finish. A good starter Scotch whisky. My wife likes it. Honey, caramel, citrus, smooth. Very enjoyable. Better than the most common high-shelfs. This one is a firm favourite in the collection, and certainly missed when it's all gone! Smooth and subtle with a reassuring smokiness. Best with a splash of ginger ale and a cube of ice. A little sweet for my liking. Very nice flavor, little burn on the back side. My first nose of it reminded me of wine. After resting a bit the honey really jumped out. Not my everyday choice but I'll most likely add a bottle to my collection. Smooooooooooooooooth... Lacks a distinct flavor. Subtlety is the name of the game here. It's a scotch I could have everyday. I am a beginner scotch drinker and have tried several different bottle recommendations and samples from Flaviar. Dalwhinnie is a must have. I put in for a bottle of it every time I order from this site. A sweeter malt with a slight smoky taste and a spicy finish. Nice and smooth. Not too smokey. I was actually not a fan of any of the samples in the box, as I am not a huge fan of Scotch in general. I'm sure they are all good, but not liking Scotch, I cannot give a fair review of how good they are. I actually would have preferred a varied sample box. i.e. one bourbon, one cognac, one tequila, that sort of thing. The Glenkinchie and Lagavulin were great but the bottle with the Dalwhinnie was broken upon arrival so I didn't get to try it. did not like the aroma but is tasted good. This is the single malt that introduced me to the sainted spirit. And one I return to when the opportunity arises. This is, for me is an arm chair in a glass. And like the arm chair, is better without any water poured into it. Great aroma and very smooth. Drinkable with everything and could drink straight or on the rocks. Not a big fan, personally found it hard to swallow and not very drinkable. Was very easy to drink. Smooth sipping... pleasant sweetness. The lingering flavor is very smooth. The sweetness stood out for me on this one. Good scotch but probably not one i would go out and buy right away. I could see drinking this is the right setting, but not an every day one for me. I like it. I'll definitely be buying a bottle at some point. Very smooth, sweet flavor. This was the clear winner from my tasting box (and the other guys as well). Smooth, a little bit sweet and a bite at the end. This one will be coming home in a larger bottle soon. Very impressive whisky, with a smoky sweetness that gave way to a peppery finish. A splash of water lengthened the finish, but seemed to dull the palate a bit. Great and easy sipping whisky! I liked the honey flavor and it was smooth to drink. You get just a little touch of apple at the end too. The history of this scotch is interesting too, looked up more info on line, could be a fun one to visit! This was an impressive whisky in the welcome box. With a few drops of water, the finish is better appreciated. Good flavor. Medium to sharp aroma with hint of honey Strong honey flavor with hints of caramel. Finishes with light airy citrus flavor with smallest hint of smoke. Very strong apple aroma at first, nice kick, and smokey flavor. Not bad, but not mind blowing. To me it's a nice alternative to your typical whisky but I' don't see me rushing to buy a bottle yet. Smooth and light. Has a bit of a bite but still refreshing. Smells of pot-pourri and tastes like Werther's Originals, with an unfortunate lingering finish of bad caramel syrup. Dalwhinnie was DalWinner of the tasting box. Fruity on the nose and a smooth and sweet taste. I dig it!!! I toured the Dalwhinnie with my family last year. A great tour and experience and the Dalwhinnie remains one of my favorites. Smooth and refreshing. Tasting it you can feel sweetness and the interesting aroma. Definitely would belong my collection at home for friends and family. Smooth and refreshing. Nice citrus and Carmel notes. A little spice. Definitely one I would have in my collection at home for company. Smells like a campfire with a sweet honey flavor as it hits the tongue. Sweetness gives way to fire and smoke. Very nice Scotch. Nice and smooth with both sweetness and smokiness. Light smokiness, great daily drink! Really smooth with a little bit at the end. But it doesn't linger. Smooth and nice flavor profile with this. This is my kind of Scotch, and I'll be adding it to the cottage bar. Very smooth flavor, especially for a 15 year. Easy to sip. Like a fine Italian woman. Flavorful, smooth, and sweet. Complex but well balanced. Great scotch for those looking to enjoy with a bourbon lover. My favorite of the tasting box. Good flavor, not overpowering. Smooth without a ton of fire. Light taste with a delightful honey finish... almost herbal. I found this better than expected. Sweet but a hint of smoke, a nice Scotch. Vey smooth very drinkable, nice straight in a good glass, great nose and follow on sweetness. Didn't need any water and certainly no ice. The sort of dram where a belt her and a bottle and suddenly the bottle is empty and your legs don't work...! An easy Highland dram to enjoy anytime. A little heat, spice and smoke, barley and vanilla along with a trace of nutmeg... Love it! Good. Not crazy about the ending nose. Bitter, floral, little smoke. Not bad. I really don't like the aftertaste though. Drink if offered, but probably never buy a bottle. A bit spicy but still very mellow and easy to drink. A certain boldness stands out and makes this one of my favorites. Light and clean, as advertised. Pretty sweet, with honey-like qualities. The sweetness also had a biscuit characteristic as well. Definitely apple and vanilla too. Straightforward and smooth. I would drink this again, but prefer Dalwhinnie's Distiller's Edition, which is smoother yet more complex. Not great, not terrible. Still new to the tasting process so rating conservatively until I have a few more samples under my belt. I've never been impressed with this distillery's offerings, and this is an example why. I'm not saying it's horrible; it's great for introducing people to the world of scotch whisky, but it tastes like the distillery couldn't make up its mind on the flavor profile when creating it, like "I don't want to use a lot of peat, and be a proper highland malt, but I like the lightness of lowland. Oh yeah, I like American and Irish whiskey so I'll add that flavor to the mix by using their barrels. Anyone of them, doesn't matter. But as long as it's smooth." Smoothness is what they got right out of it, but doesn't taste like a true highland to me. Nice smoky flavor in the taste, while the apple pops out in the finish. An interesting new experience for me, being a mostly Kentucky Bourbon guy. This was my fave out of the three. It had a sweet initial taste to the lips with the nice warm sensation afterwards. Could sip on this for days! Nice. Smooth and gentle. Sweet. This is a good introductory bottle of scotch. Flavor and burn are mild and smooth. Not huge into highlands. Not as sweet as most I've tried so wasn't disappointed. Recommend an ice ball for a better flavor. Would not buy but would partake again. Starts off almost creamy, but it thins out to a peppery finish. A drop of water blooms the other flavors quite nicely. This is good. Very smooth and mild. Not spicy at all. More apple and leather. Wow, This is my new goto.. Big citrus, Apple and nutty flavor mix. Its great with a few drops of water or a small ice cube to help release the big flavors. So smooth with a clean finish. Sweet with peppery finish. Smooth start for easy drinking. 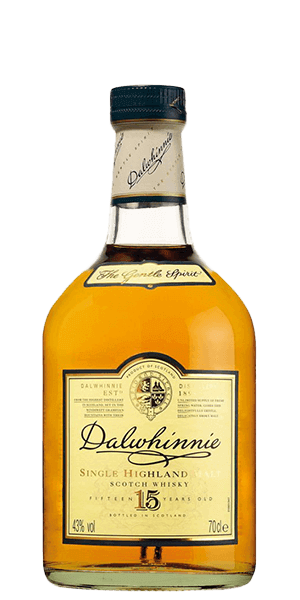 I've been a big fan of Whisky for years now but the Dalwhinnie was the first I've had with an obvious vanilla flavor. Also the transition from the sweet start the the malty finish was great. I'm definitely going to buy this bottle. Again not a Scotch drinker, I found this rather pleasing not too peaty and smoky, with a sweet after burn. This I would carry for my Scotch loving friends. I loved the Dalwhinnie 15 yr old. It was very smooth, not overly smoky but just the right balance. Great balance! 7 because its pleasant and drinkable. Id buy it. Super smooth and great peat balance. Rich flavor, and decent finish. It's a bit harsh but not bad at all. Would buy in the future. Malty sweet with a little smoke in the finish. Really like this one. Definitely one for my bar. Smooth, rich, sweet and easy sipping. Nice and smooth. Very good flavor. Really enjoyed it! Has the smooth whisky flavor I like. As I read the different descriptions in whiskeys I like I think it might be the vanilla. Nice flavor and good heat. Would consider a bottle. Very pleasing ,satisfying and relaxing with a wonderful finish ! Not bad. But not amazing by any means imo. Smooth with quite the long burn finish. Very smooth. Apple is at the forefront for taste and smell (almost sour). Wouldn't order it, but would drink it if it was free. Smooth with a hot finish. Favorite of the 3. Enjoyed the flavor and lingering aroma afterwards. First taste went down smooth. Had a little heat, which I liked. Smooth and easy drink. Spike of fire as it finishes. Nice. It's nice enough and may please some who prefer the floral taste, but it's not for me I fear. Fire. Little too much burn to it but smooth going down. Good beginner drink. Smooth and soft and crisp and fruity. Cherry and Vanilla nose. Strong flavor with thin, light mouth-feel. Short finish. Wouldn't buy a whole bottle of it though. Light and elegant. Not overly peaty. Light varnish color, autumn gold. Well rounded nose, sweetness and smoke. Taste is malty, sweet, and mineral. Finish is mostly mineral with a touch of sweetness. Vanilla, honey with hints of smoke. Very nice with a little water. Delicious smokey vanilla flavor with hints of fruit on the finish. Coming from tasting the Talisker 10 there night before, the Dalwhinnie is much more enjoyable. Slow to start but nice sweetness. Nice burn at the end. The Dalwhinnie 15 year old is the best light and fruity, non-peated Scotch I've tasted thus far. I was quite surprised that I enjoyed it so much (being a fan of the Islays). Starts off slow, then really opens up and finishes nicely. Pretty damn decent. Lighter on the roast I believe and an overall delight. Our least favorite of the three samples. A bit too citrus for our tastes. Good but just okay....didnt taste too much flavor. I like it better than Glenkinchie. Smooth and delicious. Wouldn't have bought if it hadn't been for the Welcome Sample box! The Dalwhinnie was not bad. Decent flavor. I would drink this Scotch again. I was not impressed with the Glenkinchie. I did not like the Talisker Port. Had a taste like antiseptic. Peat finish, but I like it and I usually don't like peaty whisky. Had a dram in Inverness and this would be worth adding to my collection. Very smooth smokey flavor! I really like this 15 Year old! Very smooth from start to finish. The smokey caramel taste was very nice. Once you get into the 7+ range, it's decanter worthy. This is a strong 7. Dalwhinnie was my introduction to Scotch, years ago, and it remains one of my favorites. It's still a great way to introduce someone to the beauty of whisky. Rich and sweet, smooth and boring. Very smooth. Caramel, a little smoke and vanilla. I slight hint of Apple. I enjoyed the heather notes and subtle sweetness. This feels like a well balanced scotch to me and reminds me of Drambuie without the heavy sweetness. Smove, my wife and I enjoyed it. Smooth floral notes with honey. A classic dram. I keep a bottle in the freezer for a thick cold dollop of goodness on a hot summer's eve. A solid and consistent single malt. Light, smooth and well balanced notes for a scotch newbie. Like this one a lot. Smith with just a little bite.